Now, however, Stringer says there is enough fossil and genetic evidence to say that the Sima material belongs to early Neanderthals, and also that it must be much younger than 600,000 years old. "Most of the data supporting this view actually come from studies by the Atapuerca team themselves," says Stringer. "They have shown that the skulls, jaws, teeth and skeletons of the Sima fossils show many Neanderthal features." 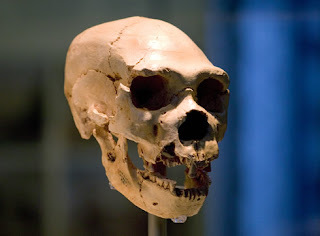 Fossil skull of Homo heidelbergensis.The Neanderthal features include a little pit in the middle of the occipital bone at the back of the skull, the shape of the face, and the patterns of cusps on the teeth. Because they classified the Sima material as heidelbergensis, the Atapuerca team regarded heidelbergensis, with all its Neanderthal features, as the ancestor to Neanderthals only. However, other palaeontologists, including Stringer, consider heidelbergensis to also be the ancestor of modern humans. They believed that heidelbergensis was a widespread species, which in Africa gave rise to H. sapiens, and in Europe and Asia gave rise to the Neanderthals. But the classification and date of the Sima fossils published by the Atapuerca team contradicted this idea. No other fossils with Neanderthal features have been dated to earlier than about 400,000 years ago. Stringer explains, "We would not expect clear Neanderthal traits to occur 200,000 years earlier than this." "Dating these bones to such a great age greatly complicates our picture of human evolution half a million years ago." Both morphological and genetic studies have suggested that Neanderthals and modern humans began to branch away from each other about 400,000 years ago. So the Sima material cannot be 600,000 years old, and must be at least 200,000 years younger, says Stringer. The Sima fossils are too old to be radiocarbon dated, so scientists have tried various other techniques to estimate their age. One method was to use the decay of radioactive isotopes to date the stalagmite that overlies the human fossils. Reclassifying the Sima fossils as Neanderthals rather than heidelbergensis puts heidelbergensis back at the heart of human evolution as the last common ancestor.The first analysis suggested an age of around 350,000 years, but later measurements suggested an age closer to 600,000 years. "I think they got it right the first time," says Stringer. Reclassifying the Sima fossils from heidelbergensis to early Neanderthal gives a clearer picture of the position of heidelbergensis in the human family tree, and also clarifies the pattern of human evolution in Europe. "Removing the Sima fossils from heidelbergensis means that the species once again makes a good common ancestor for the Neanderthals, modern humans, and probably the Denisovans (known from DNA recovered from fragmentary fossils in Siberia) too," says Stringer. "These new views on the dating and classification of the Sima material have led to a constructive scientific debate with the Atapuerca team, which will help to progress our understanding of the place of these important fossils in human evolution," Stringer concludes. The Status of Homo heidelbergensis is published in the journal Evolutionary Anthropology.